How Much Is A Lawsuit In Germany? Have you received a warning letter of a German Pre-Litigation Law Firm (Abmahnkanzlei)? Sometimes they claim unfounded fees or the claim value is too high. Sorry for my unusual English. My first language is German. A copyright infringement warning letter claims lawyer's fees of 215 euros without "Mehrwertsteuer" (VAT). The lawyer's fees depend on the value of the claim. Lawyers' fees for copyright law, unfair competition law and civil law are regulated in the "Gesetz über die Vergütung von Rechtsanwältinnen und Rechtsanwälten - RVG" (Attorneys Remuneration Act). § 13 RVG and its Appendix allow lawyer's fees of 215 euros without VAT if the value of the claim is set at 1.501 Euros. If the claim-value were €500 more (€2,001) the out of court fees are €281.30. Many of these copyright infringement warning letter are wrong calculated. They claim a damage of €700 and an "Unterlassungsanspruch" of €1,000 although the copyright violation with peer-to-peer file-sharing lasted only fifteen seconds for a blockbuster film. Can your DSL connection download a complete film of 100 minutes (1GB) in 15 seconds? The results of the lawsuit calculator have only informative character. I can't exclude bugs, programming errors and so on. The programme below interpretes the number "1,400" not as thousand four hundred but as one comma four. So you better use numbers without dot or comma. This programme calculates how much you will have to pay for legal advice or for a lawsuit in Germany. This is only for disputes that are calculated according to the value of the matter. These are basically civil law cases and public law cases. Here we don't calculate the costs for criminal law cases, criminal tax law cases or fine cases. Furthermore we only consider the costs for one person. If there are more than one person on your or the opposite side the costs are higher. Nor do we calculate the costs for east Germany - the former German Democratic Republic where the costs are 10 % lower. You only have to enter the value of your legal problem into the field and click on "Calculate". If you don't know how much is the value in dispute click on Further Information to get more details. The value of your legal problem depends on the value of your matter. If you have bought a used car in Germany for 5000 Euro and you want to cancel this purchase the value of the matter is 5000 Euro. If you have sold your german house for 500.000 Euro and the buyer still owes you 100.000 Euro the value is 100.000 Euro if you want to claim the missing sum. In family law cases like divorces etc. the value consists of the 3 monthly netto income of both partners. If both earn together 4000 Euro every month the value is: 3 x 4000 Euro = 12.000 Euro. 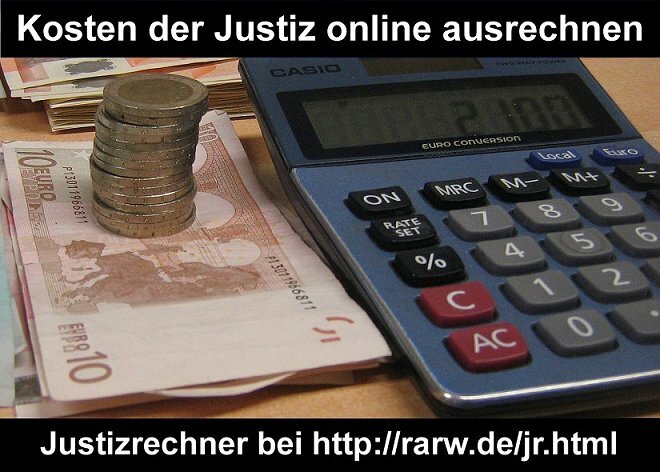 Zurück von "Lawsuit Calculator for Lawyer's Fees (RVG) and Judicial Costs (GKG) in Germany" zum Index von "rarw.de"